Nikolay Seredov is a (pretty young) guy from the Southern part of the small country Russia, and active in several combos out there. Besides being involved with e.g. Taiga and Stakhanovtsy, he’s also known as the sole member of Funeral Tears, an outfit which he started in 2007. Throughout the years, Funeral Tears did release two full lengths and a split with another mighty Russian act, Poezd Rodina (it was reviewed by undersigned and published on January 17th 2016) (as well as some singles), and now there’s a third full length studio recording, called Beyond The Horizon. It was written and recorded by Nikolay, who also took care of e.g. production, mastering and designing, and being released via Satanath Records, a label run by a certain sympathetic Mister Korolov (smiley…), who joined Taiga’s roster recently, apparently, as studio keyboardist. The album is quite lengthy (almost one hour of grief and despair), and it comes with a six-page booklet in an edition of 500 copies, in a collaboration with American label Cimmerian Shade Recordings. 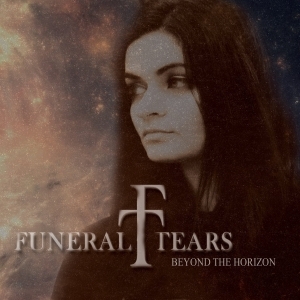 Those trusted with Funeral Tears must not be disappointed, for Beyond The Horizon goes further where 2014’s The World We Lost (Marche Funebre Recordings) ended. Beyond The Horizon compiles the better elements of Funeral Doom, not once leaving the path of sorrow and desolation. The whole album is filled with all elements that typify this unhappy yet sublime musical genre, and you might dislike the clichés, but then f*** (self-censorship). The quality of song writing and performance, as well as the production, is absolutely top! Nobody needs a renewing progression, if the result is so grandiose. The tempo is slow, truly slow, yet it overwhelms and overpowers by its massive sound. Several layers of guitars (melodious leads, monumental rhythm guitars and pounding bass lines) are like a coherent organism, creating an impenetrable wall of sound, thick and heavy. Supported by the drum patterns, which are like an entity on their own, the instrumental structures somehow exhale an expressive definition of what doomy atmospheres are meant to be. All this gets joined by a very deep grunt, spitting out Nikolay’s disgust for life and the human kind (and totally different from his somewhat hysterical screams in Taiga). His throat is not forced at all, even though his vocal timbre sounds, in a cynical way, rather frenzy than wretched. And occasionally, he uses a blackened scream (cf. Taiga) or a clean voice / spoken word – just sporadically, but at the right moments. Other important elements are the use of keyboards and acoustic guitars. The first, the keyboards, never act on the foreground, but they are like a mostly elegant enrichment, covering the heaviness in a subtle way with dreamlike finesse. The acoustic and semi-acoustic guitars are more prominently represented. Sometimes as introduction to a hymn, then again as fading outro; they put a mark on each track’s character. But sometimes these acoustics penetrate and support a track totally (listen, for example, to Breathe, to enjoy the lack of joy). And what’s more, it’s not of the pathetic kind (a sickness that occurs too often, when fake Doom bands try to be doomy). No, in this case, the acoustic guitars too are rich and mature. Russia is one of the most prolific countries when talking about Doom, Funeral Doom and Doom-Death Metal. This goes for both bands and projects at the one hand, and labels which are specialised in these genres exclusively. Believe me as I say that Funeral Tears are part of the Family of Doom from Russian soil. And my appreciation to Satanath Records’ Aleksey for releasing this great recording. Do not expect something that suddenly causes an earthquake, for being innovative, for this is not the case. But accept the fact that this kind of Funeral Doom is just, in its purest essence, like how Funeral Doom must sound like.